Muttahida Qaumi Movement (MQM) served the New York Times editor, publisher and reporter a defamation notice of US$ 10 million for the article in the newspaper about the party chief living in self-exile in London. On the party’s website, MQM reported Monday (16 September 2013) that the party with central secretariat in Karachi served the notice on Declan Walsh, former bureau chief of the New York Times in Islamabad, after the journalist’s latest report on the MQM chief Altaf Hussain discussed his grip on power and challenges he is facing. MQM, which is under spotlight after Geo News reporter Wali Khan Babar was killed in Karachi, also issued notices to the newspaper’s editor and publisher for allegedly “causing disrepute” to Altaf Hussain in what the part described as “baseless” report. Party counsel Barrister Farogh served the notice on behalf of the MQM which stated that the “baseless report” by the New York Times had “caused damage” to the repute of MQM chief Altaf Hussain. The legal notice asked the New York Times newspaper editor, printer, publisher and journalist Declan Walsh to tender unconditional apology within seven days and warned of due legal action in case of failure to do so. 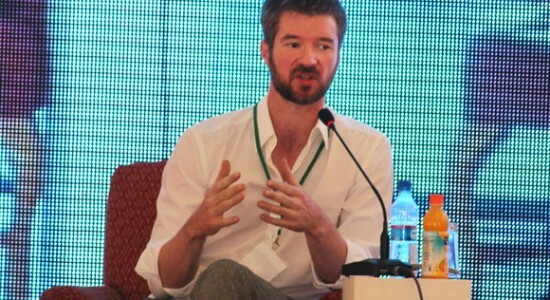 Pakistan expelled Declan Walsh days before the country was going to general elections in May this year with the government not giving details on what ground the NYT bureau chief’s visa was revoked. The September 12 report by Declan Walsh in the NYT was datelined London where the MQM chief is facing Scotland Yard-led investigation into murder of ex-party leader Imran Farooq and money laundering cases.